An error is triggered when using an identifier which does not exist, for example a variable which you did not declare yet. Place the editor cursor on the error's line and press Ctrl + 1, select Declare variable ... from the list of quick fix proposals and press Enter. 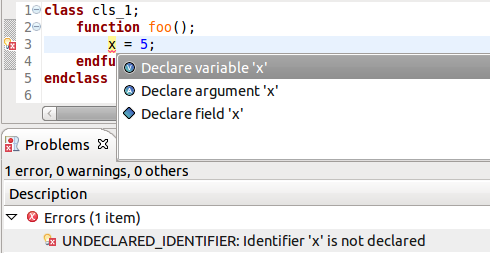 Note: The type of the new variable declaration is automatically detected from context. Note: When the same undeclared identifier is used across multiple scopes, the variable declaration is placed in such a way that it is visible for all usages. Tip: You may change the variable type. Press Enter when done.